© Copyright 2003 Dale Elliott. Dale (Ba LLB) AWSSA practiced as an attorney for a decade before turning his art interest into his new profession in `1984, and Janny, who studied art at school, has managed and administered their wide art portfolio over the years, establishing their first art gallery in 1979. They have 4 children, Lindy, Les, Mel and Jonno, all of whom have a keen interest in art in various forms. Dale & Janny are leaders of the Painting Holiday concept in Southern Africa, and they have conducted approximately 200 courses over the past 20 years. 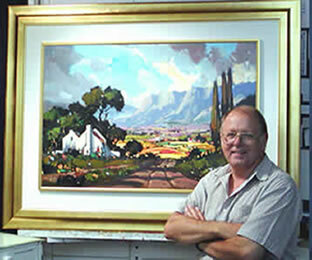 Dale, who has completed in excess of 15 000 canvases to date, is an Associate of the Watercolour Society of South Africa, and his work is represented in many collections locally and overseas. He is well known for the Commissions he undertakes, and he has appeared on television a number to times on various art-related programs. The Elliotts are also involved in promoting Dale's artwork through a publishing arm in their business, with various portfolios of lithographic reproductions. They have recently released two Art DVD's on Dale's workshop and teaching techniques and two CD's, a step by step approach to oil and watercolour painting. We hope you find the rest of our website constructive and informative. We can be contacted at the numbers alongside.